Mozilla Labs DemoParty is our upcoming online competition and series of events to foster artful exploration of the web platform. 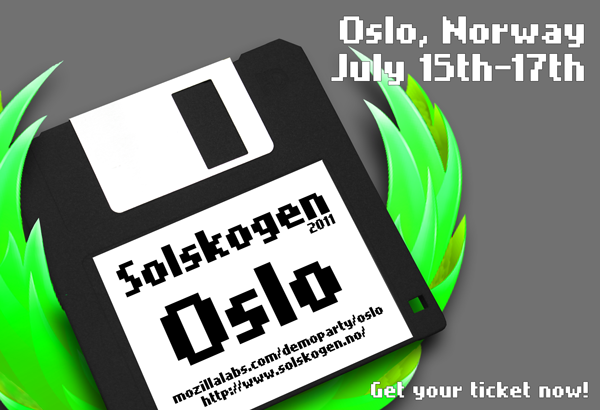 We’re excited to announce that Mozilla Labs Demoparty is partner of the Solskogen.no demoparty in Oslo, Norway on July 15th – July 17th 2011. Join us for 2 days of web (aka HTML5) demo hacking, soccer, camping, Amigas, outdoor BBQ, beers and Scandinavian hospitality! Like at “The Flame Party” in Helsinki, Solskogen 2011 will also challenge you to participate in a “Single Effect Compo“. Full compos can be submitted to the combined demo category also.